Adjustable crater voltage and crater current control – Gives operator control to achieve good weld ends. Wire diameter range- Solid wire :- 0.8 -1.2 mm Flux cored:- 1.2 – 1.6mm"
The POWER IND 400I is a semi-automatic 400A rated, constant voltage (CV)/ constant current (CC) DC welding power source. 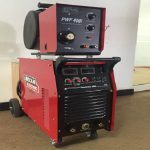 This machine features a smaller footprint and the same rugged look that customers have come to expect from all Lincoln Electric industrial welding power sources.